The House Energy and Water Appropriations Subcommittee just released its version of the Fiscal Year 2012 Energy and Water appropriations bill. It funds work on nuclear weapons and nuclear nonproliferation at levels far below the President’s budget request. The committee recommended funding Defense Nuclear Nonproliferation (DNN) at $2.05 billion, $463 million below the President’s request and $217 million below FY11 levels. We won’t know where the committee made cuts until the full committee marks up the bill. If cuts were made to programs such as the Global Threat Reduction Initiative, there could be serious consequences for national security. However, as we/ve noted in the past, not all nonproliferation cuts are necessarily bad. The committee’s decision to provide only marginal increases for nuclear weapons activities are particularly interesting, in light of the enormous focus on these programs in the Senate debate on New START, the recent House votes to insist on full funding for these programs in the Defense Authorization bill, and last year’s ultimate full funding for the administration’s request. While the committee did recommend a $195 million increase above Fiscal Year 2011 levels, this amount is $498 million below the President’s request. Again, we won’t know for some time what was cut, but the bill does single out one program for special attention: the B-61 Life Extension Program (LEP). The committee “fenced off” (withheld) $84 million of the $224 million requested for it until the National Nuclear Security Administration (NNSA) finishes the required study on design definition and cost for the project. While we still don’t know the exact reason the money was withheld, the LEP is facing a number of challenges that should be addressed before it begins. Some of these were noted in a recent report by the Government Accountability Office titled DOD and NNSA Need to Better Manage Scope of Future Refurbishments and Risks to Maintaining U.S. Commitments to NATO. The B61 LEP will be the most ambitious and extensive warhead refurbishment since the United States first began producing life extended nuclear weapons in 1999. NNSA plans to spend more than $4 billion replacing three times as many aging components as was the case for previous LEPs, for a cost of approximately $10 million per bomb. One government employee familiar with the program described the B61 LEP to us as “12 pounds of Life Extension Program in an 8 pound bag,” meaning NNSA wants to do too much to the B61. The LEP will likely consolidate four mods of the B61—the 3, 4, 7, and 10—into one bomb, the B61-12. As part of this consolidation, NNSA would like to incorporate untried technologies and design concepts—such as multi-point safety and new detonators—that alter the bomb’s safety and security. The planned scope of the LEP raises serious questions about whether these changes will affect the bomb’s reliability. These modifications will involve changes to the B61’s nuclear explosive package; in particular the plutonium-based “primary” that is the core of a modern nuclear weapon. The fact that NNSA plans to do them now is particularly hard to understand when the agency’s own analysis shows that the technologies NNSA plans to install in the primaries are not technically mature. You read that right: while many proposed surety features outside the primary are well understood, the multi-point safety and new detonators are unproven, immature technologies. The chart below, from the GAO report, provides a very clear idea of just how extensive this LEP could be—it shows the scope of the LEP that is under consideration as part of the design study. 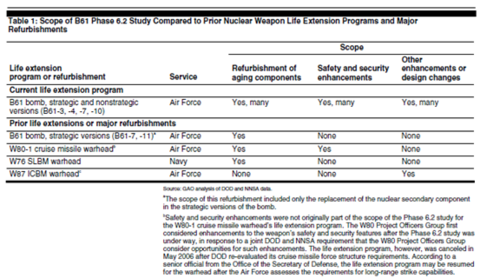 According to the chart, NNSA has never tried to refurbish aging warhead components, add safety and security enhancements, and design enhancements in a single LEP. Would all of these changes make sense? Other factors further complicate the debate around the B-61. First, NATO is just beginning a year-long defense and deterrence posture review that will look at, among other things, the role of the 180 U.S. tactical nuclear weapons (all B-61s) deployed in five NATO countries. Senior officials from three of those nations – Germany, the Netherlands, and Belgium – have asked for U.S. B-61s to be removed. A recent report found that half of NATO’s 28 member countries support complete withdrawal, and ten more would not oppose a consensus decision to do so. On the security point, the Nuclear Posture Review specifically states that the United States will maintain the capability to forward deploy U.S. nuclear weapons in Europe, but that doesn’t require keeping them there at all times. In the event that the United States withdrew these bombs and then decided to re-deploy them in a crisis, it would be cheaper and less risky for U.S. forces guard them full-time than to install technically immature surety features. In the meantime, it makes sense for the United States to pay for increased physical security for those warheads NOW, rather than waiting for an LEP that could easily be delayed for years. The Air Force’s proposed next fighter jet, the F-35 Joint Strike Fighter, also factors into the debate. For the first time, NNSA is performing an LEP in order to match a nuclear weapon with a yet-to-be fielded plane. A nuclear version of the F-35 – at an estimated cost of $300 million – is planned, but the whole fighter program is facing schedule delays and steep budget increases, causing the chair of the Senate Armed Services committee, Sen. Carl Levin (D-MI), to question whether the country could afford the new plane. NNSA’s current plan is to begin production of the B61-12 in 2017 and finish in 2021. But the issues highlighted above raise many questions that deserve answers. Before investing the $4 billion in a massive, potentially risky LEP, Congress should carefully consider another option. DOD and NNSA officials have acknowledged that they could perform a scaled down LEP that would extend the operational life of the B61 by only replacing the key limited life components. While they have argued that doing a scaled down LEP now would cost more money in the future, this would only be true if NNSA did a second LEP to install the array of surety measures they are now considering. The Energy and Water Appropriations subcommittee would be wise to proceed with caution. Congress should require the NNSA to perform a modest LEP that would only do what is needed to ensure the weapon remains reliable, safe and secure. A more robust LEP should await demonstration that technologies being used are mature and that the proposed modifications will not impact the bomb’s reliability, and greater certainty about how and where the B-61 will be deployed.